The Dior men’s Pre-Fall 2019 collection designed by Creative Director Kim Jones has just been unveiled to rapturous applause. 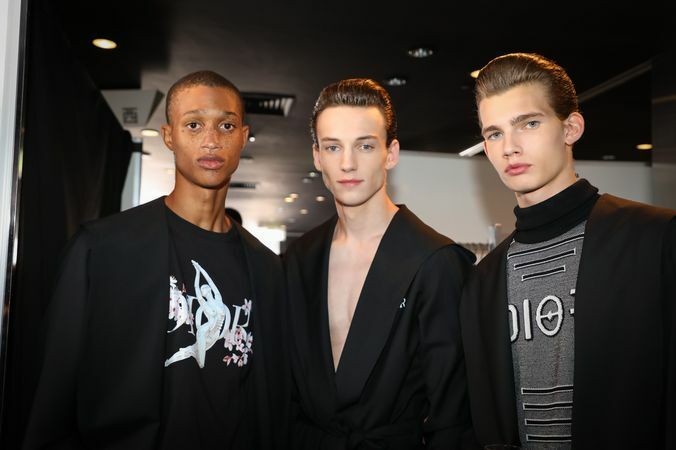 with a focus on the collision of future and tradition that defined the Dior Pre-Fall 2019 Men’s Collection shown to rapturous reception yesterday in Tokyo, Mr Kim Jones, the Creative Director of the Dior Men’s lines, destined his vision of that happens when the forward-looking technology that Japan evokes meets the immutable idea of Parisian savoir-faire with a look that is Dior 2.0. Boasting a logo reinterpreted for the season by Japanese artist Hajime Sorayama, this graphic sweater is teamed with loopless tailored trousers and silver, vacuum-formed high-top, strapped sneakers. Houndstooth check has been a key Dior code since the very start. And for Dior Pre-Fall 2019 Men’s Collection, Mr Kim Jones, reinterpreted it in a distorted weave as a self-belted, crossover coat with signature buckle by Matthew Williams, taking the precision of the House’s tailoring savoir-faire and giving it an unexpectedly fluid softness. Presented at Telecom Center Station in Tokyo, Dior continues his embrace of the ‘Dior Oblique’ cut, seen here as a sleekly tailored gray suit, the crossover effect accented with a cherry blossom-print scarf that alludes to the collection and show’s Japanese inspiration and location, respectively. Employing innovative fabric technologies, his version, in a reinterpreted embrace of lace for a new interpretation of masculinity, was anything but basic. Take your virtual seat for our men`s Pre-Fall 2019 show in Tokyo, and be among the first to discover the creatively captivating looks from Kim Jones’ newest collection. Attending at the show was David Beckham, Bella Hadid, Hiroomi Tosaka, Japanese singer and actor, Kiko Mizuhara, one of Dior’s stellar Stars in Dior, also A$AP Rocky and supermodel legend Kate Moss, among others.